Looking yummy. But i hope it’s gonna have a built-in browser (instead of opening Safari externally). Still looking forward to Newsfire on iphone!!! Great…but what’s happened to NewsFire for the iPhone? Your teaser was posted early November but nothing since then. THAT’S what I’m looking forward to David! Oh yes, that’s good news!! But what about newsfire for the iphone….? any news on that? It leaves us all wondering, will it be free? The NewsFire concept is still under design. It has to be special or nothing at all. Put your energy on Newsfire, please, I can’t wait! 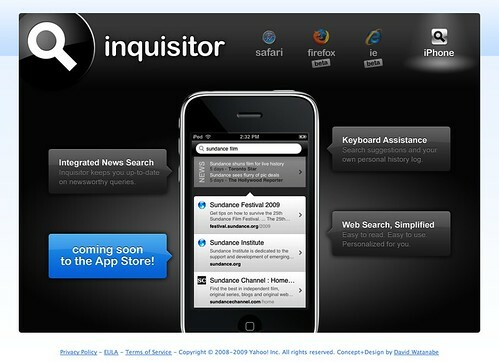 The lack of Inquisitor is the only reason I won’t go to Safari 4! I’ll watch for it. Thanks.